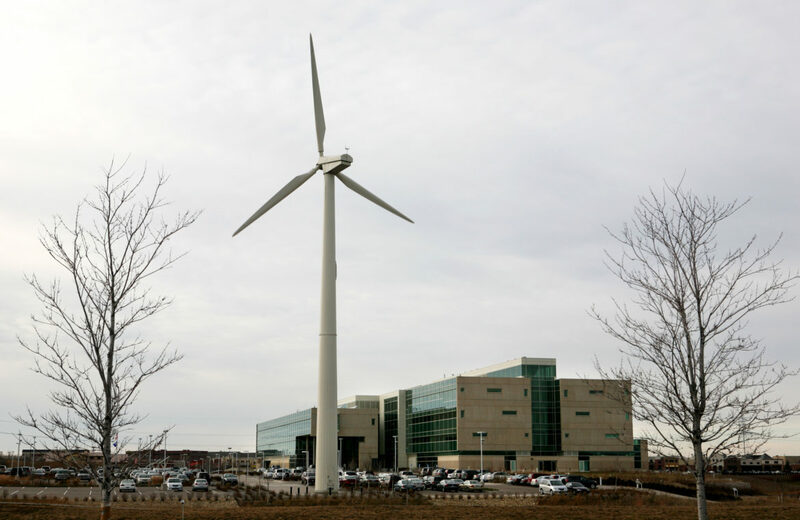 Great River Energy's headquarters campus features a 200-kilowatt wind turbine. The co-op’s announcement comes in the wake of a failed legislative effort to raise Minnesota’s renewable standard. One of the nation’s largest generation and distribution cooperatives, Great River Energy, will pursue a goal of producing 50 percent of its power from renewable sources by 2030. The suburban Minneapolis-based utility serves 28 member-cooperatives with more than 695,000 consumers in Minnesota and parts of Wisconsin. Its board of directors passed the 50 percent by 2030 measure at a board meeting Wednesday attended by more than 200 people. Great River Energy’s announcement comes in the wake of a failed legislative effort in Minnesota to raise the state’s renewable energy standard to 50 percent by 2030. It is the second Minnesota utility to announce aggressive renewable targets, following Xcel Energy’s plan to cut carbon emissions by 80 percent by 2030. Jon Brekke, Great River Energy’s vice president of power supply, spoke to Midwest Energy News about the company’s renewable plans. Q: Why is Great River Energy increasing investment in renewable energy? Our portfolio has evolved by reducing CO2 emissions and adding renewable energy. We wanted to set a direction for the future of what we plan to deliver to our member cooperatives. It needed to be a balance of competitiveness, reliability and good environmental outcomes. We think 50 by 2030 is the next logical step in our evolution. Q: Are you confident you can reach the target? Minnesota set a renewable standard of 25 (percent renewable energy) by 2025 for utilities. We met that eight years ahead of schedule, in 2017. Q: How did you achieve the standard so early? The renewable energy standard can only be met by Minnesota certified renewable energy production. The lion’s share we used was wind, but we have refuse-derived fuel plant and hydro. Not all hydro counts under Minnesota law, but small hydro does, and we get that through our relationship with Manitoba Hydro. Q: How will you reach the new standard? We first outlined it in our integrated resource plan in 2017. We have about 470 megawatts of wind now, and another 300 MW of additional wind under construction in North Dakota. We’ll buy up to 200 MW of hydro from Manitoba Hydro and invest in 500 MW of new wind. Q: Are ratepayers going to pay more for renewable energy? The renewable energy additions are the least-cost alternatives to meet new energy needs of our member coops. The new standard is a cost-effective and environmentally beneficial goal. The solar energy production on our system is being largely developed by our member cooperatives. Some coops in our membership have a 5 percent renewable self-supply option under their contract with Great River Energy. That means they can generate as much as 5 percent of their generation from renewable energy, and many of them have solar projects running or planned around the state. Q: Will the announcement mean any more fossil fuel plant closures? Our CO2 emissions are down 35 percent from 2005 to 2017. That’s tons of CO2. What has created that reduction? We went from five coal-fired resources in 2010 to two today through termination of contracts and retirement of Stanton Station. Q: Which two coal-fired plants still operate? Coal Creek and Spiritwood stations use lignite coal and are in North Dakota. We reduce carbon emissions through a “dry fining” technology our engineers developed and patented and which we market to other utilities using lignite coal. It uses waste heat to dry lignite before burning. By drying coal we get a more efficient power plant and 4 percent less CO2 emissions. Q: What other market changes could result in less carbon? All utilities are adding wind to their portfolio and that gives all of us more flexibility in operating coal-fired power plants. The next wave of carbon reductions will be because of more flexibility – we won’t be running plants at 100 percent output as we’ve had in the past. There will be fewer carbon emissions because of this in the future. Q: Coops are driven partly by the demands of their members. Is there truly rising demand for renewable energy in areas you serve? Our members will see a benefit economically and environmentally from this new goal. Half of the Fortune 500s have sustainability goals, and so do smaller businesses. By setting this vision we are helping members and end use customers meet their sustainability goals. A Minnesota utility faces criticism from clean energy advocates for continuing to operate one of the largest coal-fired power plants in the Upper Midwest. A Minnesota electric cooperative is among the latest utilities to offer a commercial green tariff program in response to growing demand from business customers. A major Minnesota utility’s electric water heater program is doing little to reduce carbon emissions — but that could change with a more robust mix of renewable energy sources and green pricing initiatives, according to a new analysis.